As he notes during the course of this interview, Steve Rude has been creating comics stuffed to bursting with dynamic, graceful, richly evocative and highly emotive art and stories for well over two decades now. An acknowledged master of the graphic narrative form almost from the moment he entered the field, Rude's protean abilities have over the years combined forces with his endlessly inquisitive mind and a deep-rooted love of craft to hone his talents to an almost supernatural extent. 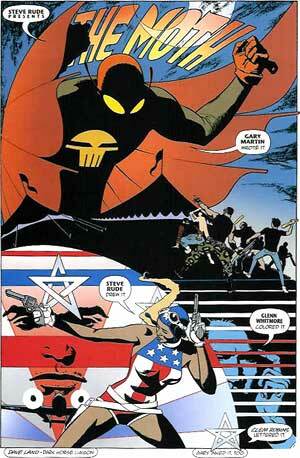 In fact, Steve Rude is now so good at creating comics that he's actually hair-raisingly scary at times. Which should come as no surprise to anyone who's even had a glancing encounter with the comics made by this native of the Upper Peninsula of Michigan, much less the man, himself. Rude's friendly, inquisitive and outgoing nature can easily give way to a steely self-certainty when the topic turns to art or comics, and what makes for good examples of each. Still, most only get a glimpse, at best, of the true strength which this thoughtful artist possesses, much less his adamant determination to do his best work always, without fail. Bill Baker: I've gathered that, unlike a lot of other artists, many of whom would really prefer not to see or even be reminded of their earlier work, you really do embrace your entire body of work. True? 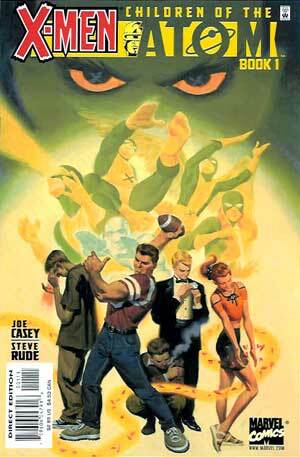 Steve Rude: Yes. I'm really different. BB: Well, why is that? SR: Because I was never embarrassed by what I did. The only thing that I see, when I look at my early work, is somebody who was trying as hard as they could, based on the ability that they had at the time. So there's never any cause for, "Oh my God...I was under this horrible deadline, and that's why it turned out so bad!" No, I made sure it was done right, as good as I possible could, so I've been spared that affliction. BB: Now, does that mean that there's never a moment where you find yourself sort of inwardly wincing at the stray panel, or the odd figure? You know, one of those moments when you find yourself asking, "Oh, geez! Why didn't I see that?" SR: No, I catch those all the time, actually, Bill. I'm always saying that. [General laughter] But, there's no way I could have seen it at the time, and that's what growth is all about. Every artist that I know is self-critical. Some are moderate, some are extreme in the way that they look at their work. And I'm as merciless as anybody. But, thank God that I don't have that problem [i.e. being unable to look at earlier projects]! Of all the problems that I think I should not have in life--based upon the fact that I've been living this long, and I should have overcome a lot of things that I haven't by now--that's not one of the things that I suffer from. But, yes, I always go back--when I'm paid to do something, or say somebody's got a book for me to sign at a show someplace, I'll just quickly page through it and I'll think, "That was wrong." And hopefully I'll store it away for the future. BB: It almost sounds like you're not just learning from those mistakes you catch, but that perhaps you're getting something more...perhaps deeper...from the experience. In other words, you're not just looking to avoid repeating any past mistakes, but that there might be something else coming with that knowledge. SR: That could be. That could be, Bill. But, mostly, I scrutinize my work so much before it is seen by the reader that, if I don't catch it after the fourth or fifth scan, then it's going to have to be caught when it's in print. And to do anything better than that would probably make me something less than human. BB: Well, how do you know when a page is done, that it's time to let go of it because it's as good as you can make it? SR: Basically, it has to be my scrutiny. And once it meets that, get it out of my sight. A lot of times, and this is something that completely contradicts something that people told me when I was younger, and that is the more experience you have in some pursuit, the faster you get. Well, that's never been true with me. I always wondered about it as they spoke those words to me when I was in my early twenties, and I can vouch for the fact that it hasn't happened. In fact, I found the opposite is true with me. The more I know, the more I slow down because I have more information to checklist, as far as catching mistakes, or things like that. And that's what I like to do--I like to catch mistakes. I go through a procedure with how I draw my pages, Bill, that enables to catch really anything that is outstandingly in error. So I will catch those things, and I will change them, and by the time that I get done with that process, it's about as fool-proof as I can possibly make it. In the early to mid Nexus days, that took me about three to five days, tops. Normally, they were three day paintings. And now, it's a week minimum to get these paintings done. But of course, the paintings show more knowledge. They show more understanding of the things that I didn't have a complete grasp on when I was younger. So, there's their theory down the tubes, at least as far as the example of my life goes. BB: It's funny, because I've heard George Perez say the very same thing regarding his speed. And he's not the only one. SR: Is that right? And George was always known as a speed demon with his penciling. He was always supposed to be fast, right? BB: That's my understanding. But, as he's aged and gathered still more knowledge and grasp of the craft, he's told me that he finds himself slowing down, and spending a lot more time on each page. Now one thing about George's work, though, is the fact that he's gotten incredibly detailed over the years, which obviously takes more time. On the other hand, it seems that a lot of what you've done is to strip away details, which then leads to the question of what is taking more time in your case? Do you find yourself spending more thought on design, on what to emphasis and what to discard? SR: I actually don't know. I know with the painting, since I have more knowledge about edge control and detail control--how to suggest it, rather than put it in--so, in painting, I can nail it down a little easier than I can with my pages. BB: Well, do you find yourself doing a lot of mental work before actually putting pen to paper, something along the line of the Zen master staring at the page for an hour before applying the initial brush stroke which does the work of twenty lines? Or are you perhaps doing a lot of drawing and then rejecting much of it, almost like flushing out all the wrong or uninspired stuff in order to find the right drawing? SR: Well, for example, the deadline work that I told you about earlier, Bill? That was actually about 85% preparation work, before actually doing the stuff. Another recent example: In one of the panels I was drawing for The Moth trade paperback, there was a horse in there. And, if you want to do it right, you basically have to follow a procedure, and I go through this procedure every time I have to draw something that I'm unfamiliar with, I don't know what they're made of, and I have to learn that. But basically I have to get out the "How to Draw Horses" book. And then I go through that procedure in my sketch book. 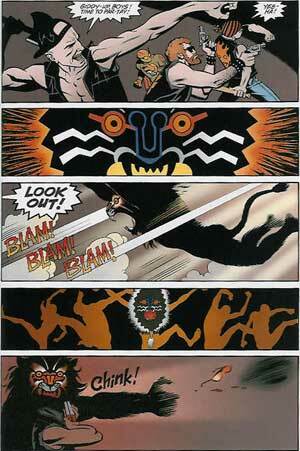 Then I'll find shots as close as possible to the shot that I'll be using in the panel, and I'll draw those. So, by the time that I'm done with all of that preparation work, I'm able to draw horses out of my head, for the most part. BB: So it's almost the Zen idea of learning it until you literally forget the technical, and just do it? SR: That's exactly right. It reminds me of this wonderful story that I heard about an artist who was commissioned to draw...I think it was a flamingo. Now, I think this is just a parable, but a guy came to the artist and said, "Can you draw me a picture of this flamingo?" And the artist says, "Yes, I can. It'll be a $1000.00, and it will take me one month." So the guy pays him, and then comes back in one month and says, "Is my drawing done?" The artist says, "Well, wait here just a second." So the artist goes in the other room and draws this beautiful flamingo in about five minutes. But when he brings it to the guy in the other room, he says, "You did this just now? I thought you were working on this thing for a month!" BB: Was that always the case, with you and your art? Has it always been as much, or perhaps even more, slanted towards the mental aspects as much as the physical creation? SR: Well, because storytelling's such a science, it absolutely requires a lot of thinking. And I draw as I think, I hope. I'm not one of these guys who just stares and thinks...to excess. It's funny, because these are all just based on mental images, you never know when those images are going to come. They can come at the speed of thought, sometimes. 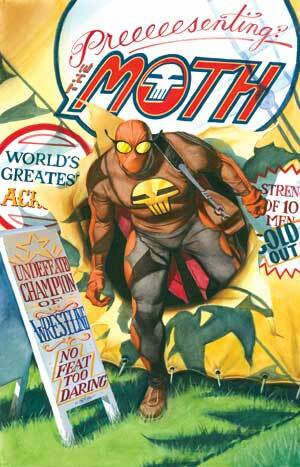 All The Moth covers that you saw me do for the first four issues came in about a fifth of a second. Literally, they came that fast. I just sat down and--Bam!--they were in my head. Problem solved in a fifth of a second. BB: We could only wish, right? SR: Well, actually, I don't wish that, because I know better than to think like that, Bill. I know what I'm up against here, and all I do is get thankful when those ideas come as fast as they do, and I'm not able to second guess myself a million times like some artists do. Besides, I've had 25 years of dealing with the experiences of having to come up with successful storytelling and good drawings for that entire time. That's a lot of time to use your brain, you know? BB: It's interesting that you brought up covers, because I was wondering if you approached doing a cover differently than doing interior work, putting aside the obvious differences like panel to panel storytelling, etc., or if you used the same head, so to speak, when creating them? SR: Sure, because the requirements of a cover are different than the requirements of telling a story over 24 pages. Yeah, it is different. BB: If you had to pick a few or the major differences, what might those be? And do you have any requirements of your own? For instance, does every cover have to capture the essence of the issue, if not display an actual or possible moment from the story itself? SR: Well, it definitely has to capture the reader, that's for sure! [General laughter] And, generally, if they capture me, they're going to capture someone else. Actually, I created this mental exercise once that I was really proud of thinking up. 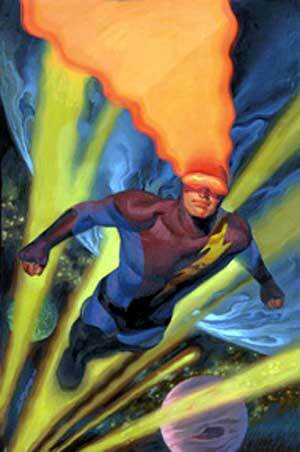 I would mentally project a comic book rack in front of my mind's eye, and study all of the covers that were on there. And then I would think of the one that stood out--remember, this is all taking place mentally, in my head--and then I would think, "Well, what don't I ever see? What colors do I never see being used? What would be an absolute, sure-fire way of grabbing somebody's attention?" And that's how I conceive a lot of these things. That was a mental projection idea that I thought was kind of neat, and it was something that I thought up after probably 15 years of doing these covers already. Because I had to find new mental tricks to visualize something that I wanted to be successful. BB: Would that also stem from the feeling I get that--and please do correct me if I'm wrong here--but, essentially, you really don't care to repeat yourself at all. SR: No, I hate that. In fact, this is one of the weird things about my brain. One of many. I don't know if other people have this particular thing, but I have this alarm, this kind of mental alarm, that goes off if I get anywhere near past territory. That's the only way I can describe it, I think. This is where I get really critical of myself. It's like, if I caught myself, doing a repeat maneuver, something would happen in my head. And, hopefully, the alarm would be loud enough to stop me, right then and there. But one thing I never do with comic books--you'll never see me do this--is this "Hero running out at you" kind of thing. 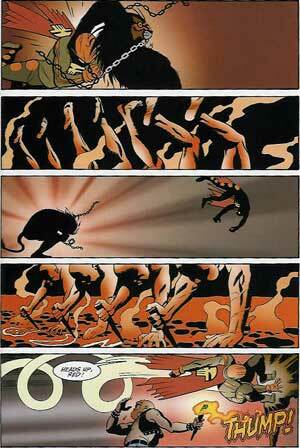 It literally drives me insane that everybody and Aunt Harriet's dog would do that trick in comic books. And I was always, from the very beginning, determined that I wouldn't do the things that I saw everybody else was doing--because it drove me nuts, to see that. It's like, "For crying out loud! Can't you exert your brain a little more than that?" I would be speaking to all of the artists guilty of doing that ridiculous cliché, of course. I mean, they work, and they're cool. But come on! SR: Please! I don't think you'll ever see that coming out of me. BB: It's funny you brought this topic up, because I think the closest you've ever gotten to that pose might be the cover for the new Moth trade. I mean, it does sort of have him kind of leaping out at you, in a sense. [General laughter] So, while it could be argued that you're a touch guilty of this vice, we'll let it slide. 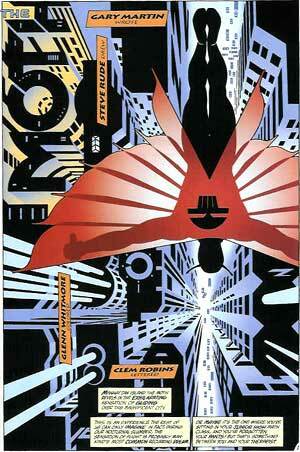 SR: Hey, he's not jumping out at you, with his arms thrust forward, with lasers blasting. He's just casually walking out and asking where the bathrooms are. BB: Exactly! [Still more laughter] Well, with your aversion to repeating yourself, do you have any qualms going back to Nexus? It's mostly a matter of timing. That's what the fans of the book don't understand, as far as the way I think about all of this. For example, if were to take any offer that came along to [Mike] Baron and I about republishing the book, well, how stable is the publisher? Are the people who work there, are they worthy of a book like this--are they going to treat it with the proper kind of respect, and give it the kind of production values that it needs? Are they going to pay Baron and I good enough so that we can drop everything and still support our lives through the continuation of this book? And if any of those answers are "No," then we're not going to subject our fans, or especially ourselves, to having that happen. Because what's going to happen is, the book may come out for a couple of issues, and then the company folds. Now, what fun would that be? If fans don't have the maturity and insight to see what may happen down the line, it's got to come from me or Baron. So, we're looking after them, even when they don't see it as that. BB: Right. It's also easy for fans to forget that allowing that kind of stuff to happen overmuch could have some real impact on how another, perhaps more established and possibly supportive, publisher view any given property, and blunt their eagerness to pick it up. SR: We'll get our fourth chance, I guess it is by now, with Nexus. But timing, in life, is everything. There are things that come together just at exact the right time. And, hopefully when it does come, people will know it, and then I'll leap at the opportunity. But right now, it's not there, and it's better that it stays there, in hibernation, rather than make it come out prematurely and have a really ugly, growling bear come at you. [General laughter] It needs it's sleep. BB: So it'll be a wait-and-see attitude on your part, then, until you find out how the reprints and such are received by the readers? SR: It is now. With comic books now, people are very cautious. That's what we're going through with The Moth right now. But I'm so determined that this book has a destiny, and a future, beyond what any one publisher may determine it to be, that I'm just going to keep going until I've said what I have to say with it--and that's going to be a long time from now. I feel, inside of myself, that I've got ten years of stories to do, just about the Moth. And we're just getting started! And, marketing conditions aside, I've got to do those things. I've got to do those books. BB: Now I know that Nexus is vitally important to you, but I'm getting the impression that The Moth, in some significant ways, means perhaps more to you than Nexus. SR: Well, I've got this opportunity to tell stories without interference from people who don't have the wisdom to make decisions like that. Like stupid editor things. This is a project of my personal destiny, and everything about it feels right. So, just the fact that I've got that in life makes it a supremely important ordeal to me. I've got to tell the stories. I've got to see where the characters are going to go with all this stuff. I want to know what is going to happen to him as much as readers do! And I feel it's like kind of the way it is with Nexus; I feel like the stories have already been written, and I just have to unearth them. BB: So it's a real process of discovery for you, then? SR: Yeah. Yeah, that's what it feels like. But it also feels like they've already been written, though. That's what's weird about it. Like when I thought up the origin of Sophie--Sophia, the Bearded Lady--I felt like she was already fully realized, and I had to kind of push the dirt out of the way and see what it was that I had unearthed. But I truly felt like it was already there, in a way similar to how my conscience will tell me things. As if my conscience would say, "No, that's not right. I don't think she's an only child, and her parents wouldn't be like this, they would be like that." BB: Your description really reminds me of the apocryphal tale of how Michelangelo spoke of discovering the form of The David in that particular block of marble. SR: Oh. Huh. Yeah, that's kind of the way it is. I would say that's exactly what I was talking about. BB: That's got to be a pretty satisfying thing to do. SR: It is incredibly satisfying. And that's why I feel so driven to disregard the circumstances that are making comic books bite the dust all of a sudden, and so often as they do. This is way more than just, "Well, my publisher isn't making any money off it, so I guess I've got to go and bake beans for a living," which is something I actually did for a living at one time. 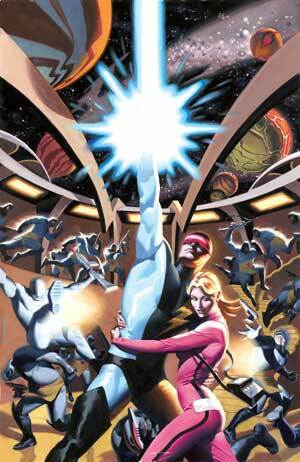 That's just not the way it's going to be with Steve Rude. I don't let other people determine my life circumstances, Bill, and it's one of the better things about me. I wish everybody had that quality. I'm not a victim to people. And that's not because I go to bed with headphones saying, "I am not a victim! I am not a victim!" every night. I just don't think like that. BB: Well, besides that feeling of what's typically called "empowerment", what would you like your readers to get from your work? SR: Exactly what they're getting now. I want them to feel the way that I felt when I was reading comics books in my early years; which is pure joy, extreme drama, and thoughts of "What in God's name is going to happen to these guys next issue?" and "I can't believe they did that, in that issue, to that character!" To me, it all mirrors real life in that you wake up in the morning and, you may have your best laid plans for that day, and then nothing happens like that, and the most outrageous things are taking place--you meet the perfect girl, or some millionaire walks up to you and hands you $500,000...because he likes you. Something like that. I think that's as much real life as it is fiction, and I literally don't even draw the line between fiction and real life, anymore. I just don't draw that line, like many people do. To learn more about Steve Rude's art, career and upcoming projects, be sure to swing by www.SteveRude.com, his home on the Web. 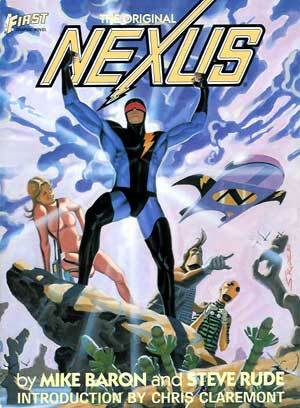 For more information on Steve's fun and fantastic series, The Moth, or the highly anticipated return of Nexus, head over to www.DarkHorse.com, proud publisher of both titles. Also, keep your collective eyes open for the Spring, 2006 release an art book featuring the work of none other than Mr. Steve Rude. This is going to be a truly special tome, folks, "A massive, 9"x12" full color book, with over 200 pages," according to a note from the head honcho of Flesk Publications, John Flesk. "It will feature private commissions, comic work, illustration work, animation, techniques, and sketchbook material. It's going to be a whopper!" Curious? Well, you'll find more info on that and all the other extremely fine books from Flesk Publications at www.fleskpublications.com. Finally, if you'd like to see more of Bill Baker's work, check out his bi-weekly interview column Baker's Dozen at www.WorldFamousComics.com/bakersdozen; and look for the official opening of his new home on the Web, www.BloodInTheGutters.com, in the early days of fall, 2005.